Embroidery Business Guide To Help You Run Your Business! 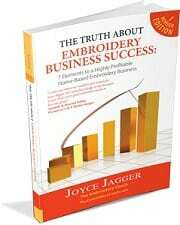 Discover The Truth About Embroidery Business Success! A Comprehensive Embroidery Business Guide to help you run your Embroidery Business! Starting a new embroidery business is not easy. it is very exciting, but it can be extremely overwhelming with all that you need to learn in a very short time. Help you create an Action Plan that is so vital to your business! My passion is to help you get off to a fast start! There is no reason why you should start your embroidery business without the sufficient knowledge that will help you succeed right from the very beginning. If you are someone that has already started your own embroidery business and is not having the type of success that you had envisioned, then this embroidery business guide will help you get on the right path to developing your own profitable embroidery business. Click on the link below to purchase your copy of this Embroidery Business Guide TODAY! What This Embroidery Business Guide Is NOT! This is not a book about embroidery! This is strictly an embroidery business guide! Having the business skills to run your Embroidery Business is very important. This book has the same basic business building information that any other business book has, but it has been written for the embroiderer with many tips that will help you with the operation of your embroidery business! If you are looking for information about how to embroider, you will need to go to The Embroidery Training Resource Center for the information to learn how to embroider! Don’t miss out on your chance to purchase this highly informative getting started embroidery business guide and start planning for future growth and profit in your own embroidery business!